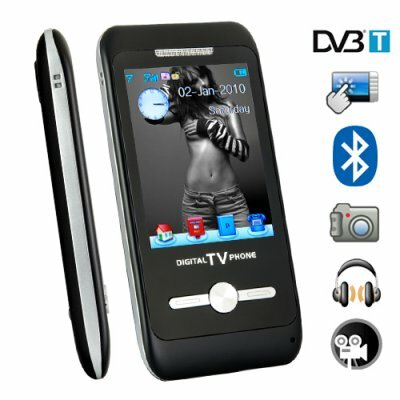 Successfully Added 3 Inch Touch Screen DVB-T Multimedia Cellphone with Bluetooth to your Shopping Cart. Digital TV on your mobile phone. This unlocked digital Dual-SIM cellphone combines the world of communication and entertainment in to one single slim touchscreen mobile phone. CVDQ-M66 comes with a rich selection of multimedia applications along with digital TV and a bonus 2GB micro SD card. Get your hands on this communication and media power house which also comes in a beautiful 3 inch touch screen. It's slim design allows for the easiest of carry around mobile phones at just 12mm in thickness, which is the same as an iPhone. For complete peace of mind, rest assured that not only will you never miss a call again with this digital cellphone, you will always be entertained during your commutes. A mobile phone primary function is always about communication. Well, then what do you do with it, when you're not talking or texting. With the M66, you can enjoy watching your favorite videos, and listen to your favorite music thanks to the incorporated MP3 and MP4 player. The FM function also allows you to record your favorite FM Radio broadcasts, so when your traveling on the train or bus, just insert the included headphones and enjoy live feed talk show or music radio. Last but not least. Digital TV, that’s right. This cellphone comes with a Built in DVB-T receiver, allowing you watch free view digital channels straight on your mobile phone. The sheer beauty of this ultra slim mobile phone with its esthetically pleasant design, makes the M66 feel great and smooth in the palm of your hand. Built with touch vibration feedback to user command inputs, along with a side gadgets bar, similar of that in Windows Vista. The M66 side gadgets bar can be viewed and hidden for best user viewing and accessibility. Containing an impressive feature set, this mobilephone is the perfect communication gadget to help make your daily life stress free and more entertained. Global communication with text and picture messages (SMS and MMS), Bluetooth, two SIM cards, and a rich selection of PDA software tools make this phone perfect for the person on the go. Don't delay, click "Add to Cart" right away and in a few days you could be the proud owner of this state of the art unlocked dual SIM tri band touch screen mobile wonder with incredible DVB-T reception! Brought to you by the leader in factory direct China electronics - Chinavasion. How can I find out if this DVB-T cellphone works in my country? Will this digital TV cellphone work in North America? Yes, apart from the DVB-T feature, all other aspects of this cell phone will work in North America. Do I need a new SIM card to use this cellphone, or can I just insert my current O2 SIM Card? No, you do not need to buy a brand new SIM card, you can just insert your current O2 SIM card into this digital TV phone and start making calls straight away. la DVB-T funciona en españa? [Chinavasion Editor: Isabel, thank you for your question. Please log into your account and contact our customer support team and we will try to help you determine if the dvb-t in your region uses the mpeg-2 or mpeg-4 transmission standard. This will help us determine if the DVB-T function of this phone will receive a signal in your hometown. All function work in France. Feels like a high quality-phone right from the start. I find it a little bit difficult to watch TV where I live, but that has probably nothing to do with the phone. Many thanks to Chinavasion for good support and a very nice product.